When a couple gets divorced, many simply forget about estate planning. However, it can be an unpleasant surprise to realize that Nevada law enacts certain changes after a divorce has occurred without you or your spouse doing anything. If you do not update your will and ensure you are familiar with the relevant estate planning law after your divorce, it is plausible that your assets may wind up in the hands of someone you did not expect after your passing. Why Do I Need A Will At All? Some people wonder why they need a will at all, given that every state in the U.S. has laws governing the disposition of assets of those who never make one. If you die intestate, you have no ability whatsoever to affect the distribution of specific assets. Nevada’s intestacy laws stipulate a very clear succession order for how your assets must be distributed. This also may cut someone out of your will for whom you wish to provide. Nevada law provides that any asset you own that comes with a right of survivorship, such as a piece of real estate, generally goes to your surviving spouse or ex-spouse. 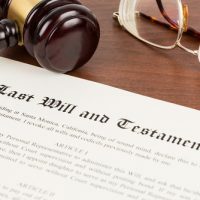 However, other assets will most often follow the order provided by law or will- generally, in intestate succession property goes to the surviving spouse and any offspring, followed by the deceased’s parents, followed by siblings, followed by distant kin. This may disinherit, someone for whom you intended to provide. There is a provision in Nevada law that explicitly states that if you have made a will dated before your divorce, any provision or benefit granted to your (now) ex-spouse in that will is null and void, unless you take specific steps to affirm the bequest. It is important to be aware that if the bequest or benefit is invalidated, it is generally treated as though your ex-spouse has predeceased you. This may not seem like an important distinction, but it is quite important in terms of the order in which heirs may receive bequests. Divorce is more than physically and emotionally separating from a person; it can affect areas of your life that you may not even think about. If you have questions about your estate planning and what needs to change after a divorce, contacting the lawyers at the Kainen Law Group can be helpful. Contact us today to set up an initial consultation.